Labels feature in Gmail provide easy way to organize email messages. You can create multiple labels and add / assign more than one label to specific email message. Further, you can view all email messages with specific label for quick browsing of messages as per requirement. You can get started by creating new Labels in your Gmail inbox and then assigning them to specific email messages. 1. After Gmail login, click on Settings icon at top right and click Mail Settings option. 2. Then click Labels tab on the Settings screen. Alternatively, you can click Labels button (or press L if Gmail Keyboard shortcuts are enabled) and then click ‘Manage Labels’ option. 3. On the Manage Labels screen, enter name for the new label in text box and click Create button to make a new Label. 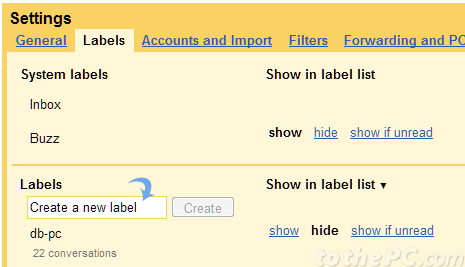 You can see list of existing and new labels under the ‘create a new label’ box. 1. Click to select specific message in Gmail inbox. 2. Then press L key or click Labels button. 3. Then click to check Label or Labels which you want to assign and click Apply button for the assignment.